Above - Front: (L to R) Ruben Garcia, SBA District Director, San Diego; Dr. Melinda Nish, Superintendent & President, Southwestern College and Victor Castillo, Director, San Diego Center for International Trade Development, hosted by Southwestern College. Immediately behind Ruben Garcia is Cynthia Harris, SBA District International Trade Officer. Back: Representatives from the San Diego & Imperial Counties Small Business Development Center Network (SBDC), SCORE San Diego and the SBA San Diego District Office. 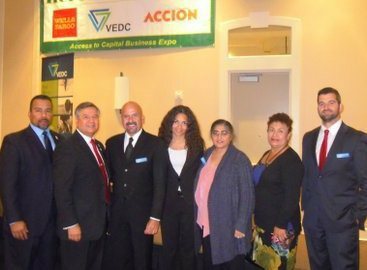 Above: San Diego SBA's Ruben Garcia, District Director (second from left) and Rosa Rodarte, Lead Economic Development Specialist (second from right) with the VEDC board members at the 5th Annual Here's the Money! Access to Capital Business Expo. Ruben and Rosa both made presentations at this event and Rosa also work an SBA exhibit table at the expo. 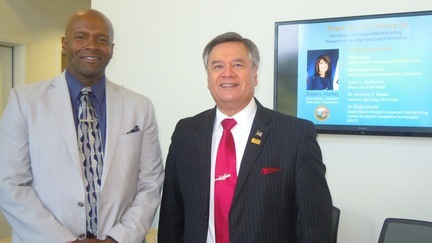 Above: (L to R) - Tony Knott, Information Officer, CA State Board of Equalization's (BOE) 4th District in Irvine, CA and Ruben Garcia, SBA District Director, San Diego. Both Tony and Ruben were speakers at the BOE's San Diego Manufacturing, Research, & Development Lunch Workshop, held at San Diego City College. Left: BOE event participants enjoying their lunch. Above: Victor Castillo, Director, San Diego Center for International Trade Development and Sandra Donzella, Regional Director, Export-Import Bank giving their presentations at the June 3rd Are You Ready to Export? workshop, held at the Escondido Chamber of Commerce. Martin Selander, Regional Manager, SBA Newport Beach, U.S. Export Assistance Center, also made a presentation and Cynthia Harris, SBA District International Trade Officer, coordinated and moderated the workshop. Left: (L to R) Wayne Bell, SBA District Director, Wichita, KS; Ruben Garcia, SBA Districti Director, San Diego, CA; and Robert Nelson, District Director, Massachusetts. 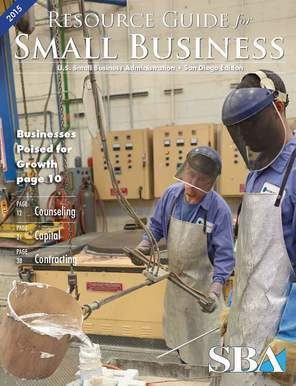 The 2015 Small Business Resource Guide for San Diego and Imperial Counties is now available online! The SBA San Diego district office conducts monthly entrepreneurial training programs for transitional military at local military facilities throughout San Diego County. Representatives from SBA and our resource partner organizations, SCORE and the Small Business Development Centers provide the training. Two Boots to Business programs will be conducted in July 2015. Click here to learn more about the Boots to Business program. Contact Maria Hughes, 619-727-4871 or Mike Sovacool, 619-727-4881 for information about upcoming Boots to Business training programs. The SBA San Diego District Office and AARP are conducting two free Summer of Encore Mentoring events in the next two months. The first will be July 30th, from 9:30 a.m. to 11:30 a.m., at 550 Corporate Center, 550 West C Street, Suite 570, San Diego, CA 92101. SBA and AARP offices nationwide announced a new Summer of Encore Mentoring initiative, with events specifically designed to help encore entrepreneurs who want to start or grow a small business. Summer of Encore Mentoring events are scheduled for July and August 2015, with more encore events offered throughout the year. We’ll be matching up “encore entrepreneurs” with successful business mentors and business experts for advice and assistance. To find a local event near you go to www.sba.gov/encore. SBA also has free online courses targeted at helping encore entrepreneurs start or grow their businesses. Go online to www.sba.gov/encore to access the online training and other resources. We’ll be hosting a webinar series to help current and potential encore entrepreneurs. For more information, and to register, visit www.aarp.org/moneywebinars. There’s no better time to start a business than today. For Americans, especially those over 50, why not make this summer a fresh start to the next chapter of your career. We are sad to lose Mary Lake, but wish her luck at her new job at SPAWAR. Mary has been stationed within the SBA San Diego District Office as a Procurement Center Representative for SBA's Office of Government Contracting for the past four years. What Are the Top Five Disaster Risks to Small Businesses?